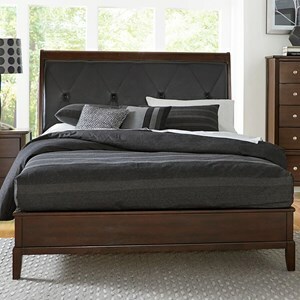 Build your bedroom with a contemporary style when you bring home this upholstered full bed. The headboard of the bed features three large panels that shows off a black upholstery with accent stitching between each of the panels. The footboard also features a panel design however it is of the same grey finish as the rest of the bed. 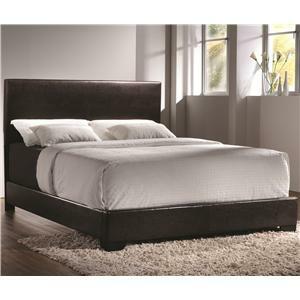 The piece features sharp lines to create a modern silhouette perfect for building your bedroom around. The 2042 Contemporary Full Bed with Upholstered Headboard by Homelegance at Beck's Furniture in the Sacramento, Rancho Cordova, Roseville, California area. Product availability may vary. Contact us for the most current availability on this product. 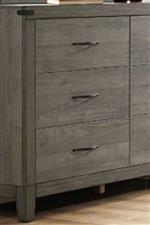 The 2042 collection is a great option if you are looking for Contemporary furniture in the Sacramento, Rancho Cordova, Roseville, California area. Browse other items in the 2042 collection from Beck's Furniture in the Sacramento, Rancho Cordova, Roseville, California area.